Our first organized initiative (totally unexpected) was to collect money for the devastating emergency that resulted from Hurricane Ivan in September 2004. 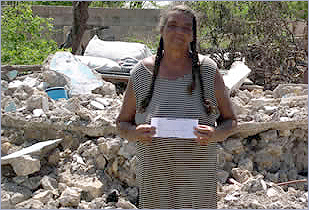 Treasure Beach Foundation collected more than $20,000 U.S. from more than 100 donors, mostly from guests who also loved Treasure Beach’s people, but also from caring villa owners, as well as relatives and personal friends. And, due to the generosity of so many, we were instrumental in supplying emergency rebuilding supplies to 132 families—enabling them to pick up the pieces and begin their lives anew. Our donations also went to repair damages to the local elementary school. We were there again to assist after Hurricane Dean struck in August 2007. Our donors provided more funds than all other organized sources together, again enabling residents to get back on their feet. Special attention was provided to the pre-school and to families with children and the infirm who had no other sources of assistance and who were not in a position to help themselves. Make a secure online donation (in any currency) using the button below. When Hurricane Ivan struck in September 2004, Treasure Beach Foundation collected more than $20,000 US and helped 132 families rebuild. Treasure Beach Foundation collected substantial funds after Hurricane Dean in 2007, assisting those not in a position to help themselves.